Sometimes, it is just too easy. Battlefield Earth defies description. It is done so badly that it is easily the worst movie of the year thus far. Regardless of what anyone may say, the only reason this film exists is because John Travolta wanted to make it. The novel Battlefield Earth is by L. Ron Hubbard, founder of the Church of Scientology, of which Travolta is a member. In fact, Travolta originally was to play the lead in the film, but by the time production finally started (the film was pushed around for nearly two decades), he was too old. The film by no means espouses any principles of Scientology. Unless of course, greed, stupidity, and revolution are basic tenets (our lawyers are telling us not to make any jokes right now, but it is hard to resist). Travolta (A Civil Action, The General's Daughter) is an overrated actor. He is not a bad actor, but then again, he is not a good one. He is merely a decent one, and for some reason, many people adore him more than he deserves. Here, he is pitiful. He plays Terl, a Psychlo. The Psychlos conquered Earth long ago and enslaved humanity (they call them man-animals). Travolta tries to come off as evil, but merely seems stupid. Half of the sounds coming out of his mouth are laughs, and try as he might, Travolta's evil laugh does not sound such. Forrest Whitaker (Ghost Dog: The Way of the Samurai, Light It Up) is even worse. Whitaker is a great actor, and none of his abilities are used here. He plays Ker, another Psychlo (one that resemble the Cowardly Lion), and probably three-fourths of his lines are laughs. By far the most embarrassing performance is by Kelly Preston (For Love of the Game), Travolta's wife and fellow Scientologist. Thankfully, she is only in the film for about half a minute. Battlefield Earth takes place in the year 3000, and chronicles the human uprising against the Psychlos. The humans either live like cave dwellers or are slaves to the Psychlos. 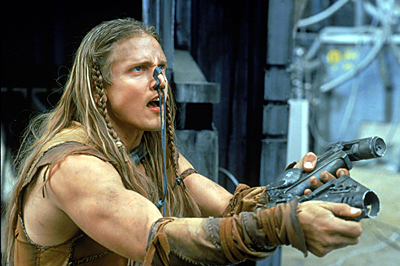 Enter Jonnie Goodboy Tyler (Barry Pepper, Saving Private Ryan, The Green Mile), the human with the stupid name. Jonnie ends up a slave Terl experiments with him by giving him additional intelligence. Terl wishes to use man-animals to mine for gold. See, the Psychlo's government structure is like a corporation. They call their home planet the "home office," and throw around terms like "leverage." Now, Jonnie knows geometry, microbiology and the seeds of revolution grow within him. He leads a band of humans against the Psychlos, culminating in an ending so stupid and far-fetched (even within the bounds of the movie) that it is unintentionally hilarious. The screenplay by Corey Mandel and J.D. Shapiro is full of holes and inconsistencies. Plus, nothing really happens in the first hour. Apparently, the Psychlos are extremely smart, but at the same time, extremely stupid. Humans, who are stupid, are also smart. Keep in mind the Psychlos are close to ten feet tall. How does the audience know this? Probably the platform shoes and director Roger Christian's habit of shooting Travolta and Whitaker from near the ground, with the camera pointing up. Also, for a science fiction film coming out in the year 2000, the special effects are all over the place. The spaceships are decent as is the makeup, but the alien planet looks very fake. Battlefield Earth also uses screen 'wipes' for transitions between scenes, something not really done since the seventies. Everything from the spaceships, the shots, the scenes, and even the weapons are derivative of other, better, science fiction television shows and movies. 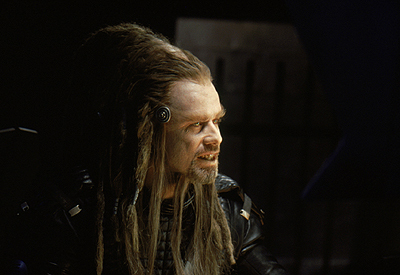 The only possible reason to see Battlefield Earth is for the laughs, but sadly the movie drags on so slowly that sleep is more likely. 1 hour, 57 minutes, Rated PG-13 for intense sci-fi violence.